5 o'clock is a time of day on vacation, which is hard to consider as the time of normal waking. Outside the windows there is still a light twilight, which encourages more to sleep than to any preparation for going out. However, you have to get up and a warm bed tempts you to go back to it, put your head to the pillow and catch even a dozen additional minutes of sleep. Only a solid breakfast consisting of several Cretan delicacies is able to stimulate the body to move and force it to act. We leave Hotel Glaros several minutes before six o'clock. Although there are still street lamps still outside, the sky is already turning blue and gray. After leaving the hotel, we pass by a few weary Greeks and tourists who after a night spent in one of the few clubs in Paleochore finally return home. Interestingly, the town itself, although deep in sleep, has an element of life in it. Along the empty streets, there are more and more vans that bring supplies to stores and taverns. A cheerful garbage truck team, which left one of the side streets, talks about the few Paleochora residents encountered. Every now and then you can hear the characteristic Greek phrase: ti káneis? Despite the fact that everyone has to do their job, they will always find a moment to ask if everything is alright. At the bus stop, located right next to a modest caffee cell also serving as a bus station, there is a small group of people gathering who wants to spend the day in the Samaria Gorge. At the table set in the middle of the room, the sleepy Greek sells tickets for the bus with a slow motion. On the stove behind his back a traditional Greek coffee is cooked in a small pot. It can be seen that it has a heavier start to the day and needs to provide a boost of energy to the body. Shortly after the scheduled departure time, a somewhat tired KTEL bus arrives at the bus stop. Drivers, however, is not in a hurry to go to the course of the Omalos plateau. Somewhere from the nooks and crannies of his cabin, he picks up window cleaner and a roll of paper towels. Over the next few minutes, he puffed up the broken windshield of his vehicle with extraordinary care. Finally, the dumb gesture of the hand drawn for the ticket tells everyone that he is ready to go. It's high time to set off to the arduous climb to the Omalos plateau. The section of the road from Paleochora to Aria Irini is mostly a relatively narrow road, which is full of tight and steep turns. It is during such journeys that you can easily appreciate the skills of the local bus drivers. Overcoming some corners requires incredible agility, the use of the full width of the road and total mastery of the vehicle. In the performance of our KTEL driver it can be doubly spectacular, especially when it operates the steering wheel using only one hand. And this is not due to laziness, but only because the other is busy at the moment holding a cell phone or shielding the eyes from the glaring rays of the rising sun. After passing the pass, along which a number of wind farms were built, we can see an even surface of the Omalos plateau. In the hilly part of Crete, such a vast flat area is an extremely surprising picture. We reach Xyloskalo just before 8 o'clock. At this time, a small hostel and a ticket office are still hidden in the shadow of the surrounding mountains. Several groups of tourists are pouring out of parked buses, which are surprised by the coolness at this altitude. At this point, nobody seems to be surprised by the long sleeves of our blouses. As you can see, it is always worth getting ready to go hiking in Crete. Although the hostel tempts with freshly brewed coffee, however, we decide not to delay buying tickets and entering the trail. Every minute, more and more people appear in the parking lot, which arrive with subsequent buses commuting on Xyloskalo. The first few hundred meters of the pwe turn by at our own pace. Unfortunately, after a while we come across a strange embolism, created by people who did not bring happiness to their shoes. Having finally "muted", we manage to get back to the original pace. The beginning of the trail is in our opinion one of the most pleasant parts of Samaria passage. Still cool air and a large amount of shade make the walk is not tiring. A clearly marked and well-prepared path means that the march is not too absorbing and basically enough to let yourself be carried. Depending on your needs and willingness in the next points where you can fill up the water, we take short breaks. On the way, we also stop to take some shots with the camera and to refresh the existing base of your photos. We take the first long break to rebuild the energy supply at the Agios Nikolaos chapel. From this point, it is also clearly warmer, so we make a small reorganization of the outfit. In the end you can get rid of warmer things with long sleeves. The next stage of the trail leading from this place is an extremely picturesque part of the gorge. Countless times one crosses the stream flowing through the bottom of the ravine, and in each subsequent breath of air one can feel the intense aroma of the hot pine forest. Time and again the murmur of water flowing between the stones is heard. In places the path is a bit distant from the bottom of the ravine, climbing steeply onto one of its slopes. Finally, after one of the longer sections you can see a stone bridge that leads to the village of Samaria. Although currently this abandoned settlement is not inhabited, it in the old days was a small self-sufficient community that ruled its own harsh laws. Today, descendants of the hard inhabitants of Samaria can be found in the village of Agia Roumeli located at the end of the trail. Looking at the high rocks surrounding this ravine area, it is easy to imagine how isolated the Cretans inhabiting the island's formerly isolated community were. To come here was a real challenge and required good knowledge of the surrounding mountains. I do not think anyone will be surprised that Samaria has always remained in a fully independent territory, which none of the occupants of Crete had in its possession. The ruins of the Samaria village are also one of the biggest stops you will find on the trail. Many people here take a longer break to relax and to bite a little something. In this place you will also find toilets. If you are lucky, you will also find "wild" goats Agrimi, colloquially called kri-kri. They got used to people and often come up to get something to eat. We also stop it for a long time. We partially spare our supplies of provisions, we replenish water supplies, and then we move on to the rest of the road. This part of the journey is, in our opinion, one of the heaviest and longest (about 4 km) sections of the route run through a dry riverbed. Legs tired and burdened by the hardships of their previous wanderings have to wade between the large stones forming the rock rubble located at the bottom of the ravine. In many places the path is not marked out and basically the only thing you can follow at this stage of the trip is only your own comfort and of course the general direction set by the rock walls of the ravine. Once in a while, we stop our journey to admire the amazing steep walls of this part of the gorge. The impressions are amazing. In a few placeswe manage to spot the birds of prey circling over our heads. It is a pity that some of the people rushing towards Agia Roumeli, completely do not notice these beautiful views. In this part of the ravine you also have to expect a much higher temperature. It is clear that we are getting lower and lower, and only the memories remain after the morning cold alpine air. The rays of the sun, which penetrate the interior of the ravine, clearly remind us that we North people must use such benefits as filter creams. Before the next stop, the path again becomes much narrower and again climbs above the bottom of the ravine. After a while, we enter a small forest grove, where there is another stopping point, which from the chapel built here is called Afendis Christos (αφέντης χριστός - Lord Jesus). Many people relax on the benches and walls in the shade. We also decide to take a longer break. The more that after a while there is a perfect excuse for this. An elderly Greek who is part of the park guard approaches us and gives us a questionnaire. What an amazing coincidence, we have already repeatedly wrote about this cyclical study concerning tourists visiting Samaria, and today we are becoming part of it. Rested and nourished, we return again to further wanderings. Ahead of us is probably one of the most spectacular places in Samaria, ie the Iron Gate. The trail is slowly lowered towards the bottom of the ravine again. Arriving at small wooden bridges in the distance you can already see this famous rocky isthmus. Along its eastern wall, a small wooden jetty was built, which allows the part of the ravine to pass through with a dry foot. Further wandering is definitely less attractive. From here the ravine becomes more and more extensive and the views are much less picturesque. About a kilometer from this place there is a southern entrance that marks the boundaries of the park. In a small stone building there is a checkout point, in which the ticket is torn off the second part, which is proof that the tourist has left Samaria. Now there is nothing else to do but reach Agia Roumeli. Along the way we pass the buildings forming the former old part of this town. Although most of them are now abandoned, some of them are used again for tourism. If you are extremely thirsty or you have an amazing hunger, then here will be the first place where you can buy food and drink. Along the way, we also pass an extremely suggestive advertisement, which encourages us to use the services of a bus circulating between this place and the port side of the new Agia Roumeli. However, we are not ready for compromises, we have already passed 16 kilometers, so we will go and the last piece of the trail. It must be admitted, however, that the open space and the heated concrete surface of this road does not encourage further walk. After a dozen or so minutes we reach Agia Roumeli. At the beginning, we buy return tickets for the ferry, and then we sit in one of the taverns without much fuss. As a reward for a well-done task, we fund a fruit salad with ice cream and two large portions of cold orange juice. In our opinion, this is the best set after such an effort. We are looking for a slightly refreshing look around the tavern and at one of the tables we see Mr. Roussos Viglis, the creator of the Samaria Experience program. What a nice surprise! We have written about this initiative several times, so we take the opportunity to congratulate him on creating an unusual program of visiting this gorge and its surroundings. We also do commemorative photos. Heading towards the coast, we notice that the closer to the sea crowds in taverns are getting bigger. In the port area, they reach almost exorbitant compaction. Not toWe understand the urge to occupy the taverns in this part of Agia Roumeli, when somewhat deep in the village you can find many other, almost empty and no less charming places. Waiting for the ferry, we are going to help out a few moments in the sea. The cold water that splashes your feet works like a cooling compress. We relax by walking along the shore. As if we were still not walking that day;). You can see our legs after such a walk do not want to stay in a place too quickly. The crowd thickening in the port gives us a clear signal that the time of leaving Agia Roumeli is slowly approaching. We occupy a strategic position on a narrow shadow strip located under the roof of one of the taverns. Within a dozen or so minutes, with a small wall marking the terrace, it is done not less compressed than in the tavern itself. Everyone is looking forward to getting on the ferry and heading back to the hotel. It is worth noting that at about the same time from the port a ferry going to Chora Sfakion and the one whose destination is Paleochora leaves. Many people are wrong and initially there is a fairly large queue of people willing to board before our ferry to Paleochora. After a short information, however, the crew leave with a receipt. They already know that they will have to wait for their ferry, which is just coming back from the island of Gavdos. The number of people flowing to Chora Sfakion is incomparably greater than that of Paleochora. We are very happy because our ferry is not crowded and we can take exactly the places we want. Already aboard the ferry, we can observe an amazing crowd of people entering the neighboring ferry going to Chora Sfakion. This is another argument confirming our thesis that the choice of Sougia or Paleochora as a base for the Samaria ravine is definitely better. During the cruise, we come to the conclusion that it was an extremely successful day. Although this was our third visit to the Samaria Gorge, we conclude that we will definitely come back here more than once. For us, this place is a great excuse to get carried away and get really tired. In this case, the key is choosing the right spot, from which you can quickly get KTEL to the Omalos plateau. Paleochora or Sougia in our opinion meet such criteria best. Convenient access to the upper entrance at Xyloskalo and the lack of having to do a long tiring bus trip are the two biggest advantages of these start-up locations. In contrast to trips from other towns, your return journey will be limited only to the ferry, which you reach to one of these two towns. Unlike other tourists who spend the rest of the day on long returns, you will be able to devote this time to the regeneration of strength in one of the fine local taverns. I sincerely recommend this option. If you are looking for a good and cheap hotel serving delicious local breakfasts, we recommend you the family hotel Glaros , located in the center of Paleochory, near the KTEL stop. This object offers several typical Cretan rooms, whose purity is at the highest level. The hotel also serves a tasty Cretan breakfast, and the owners are very friendly and helpful. A good option is also to stay overnight in Agia Roumeli. In the village you will find many excellent family hotels and boarding houses that offer accommodation for really reasonable prices. 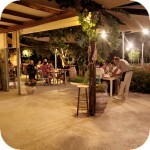 We can recommend the Artemis hotel , which is run by the creators of the Samaria Experience program. The next morning you can take a ferry to Paleochora or Chora Sfakion. Before going on the trail, it is worth itthink what to take with you. One of the basic currencies that should guide you is to limit the equipment taken to a minimum. Remember that each excess kilogram will be lifted by you for a distance of about 18 kilometers. Therefore, it is worth rethinking the sense of taking a set of beach towels, a tube and mask, swimming shoes and other similar things with you. Yes, it would be nice to have them with you in Agia Roumeli, but I think this one time can be done without them. The minimum equipment should, in our opinion, include such things as: comfortable and solid footwear on a thick soles, airy sun protection clothing, a small bottle of water and a few sandwiches and delicacies that allow you to rebuild your energy supply. Remember not to overdo it with the amount of water that you intend to take with you. A small bottle or just a PET bottle with a capacity of up to 1l will be sufficient. If you are not sure about your legs, or have problems with walking on a very uneven surface, you should also think about taking trekking sticks with you. Certainly, they will make it easier for you to pass the lower part of the trail and help relieve the joints. Personally, however, we do not consider them to be a necessary part of the equipment on this route. Its major part is so simple that even a mid-sized walker should not have problems. If, despite everything, you decide to take trekking poles, we recommend those that have the option of folding. Personally, for a few years we have been using an ultra light model of Fizan Compact aluminum poles, which after folding have a length of just over half a meter (the height of a typical backpack) and weigh slightly over 300 g (pair). At the end it is worth returning to the subject of footwear. Although many people approach this issue quite disrespectfully, however, in our opinion footwear is one of the most important elements determining how you will receive this trip. They must be solid boots with an aggressive sole. Trekking footwear is especially suitable (there may be ankle boots or so-called approach shoes). From our own observations of people passing by Samaria, we also saw that running shoes for running are pretty good. If someone feels good in trekking sandals, he can use such footwear. We, however, after several visits in Samaria, we must admit that the covered shoes work much better. It keeps the foot more stable and protects fingers against accidental contact with sharp stones. We have also seen many people walking through Samaria in so-called sneakers, but in our opinion these shoes have too thin soles that do not isolate the feet from irregularities and stones and do not provide adequate cushioning. Due to the distance traveled in Samaria, it is also worth remembering that it was already checked shoes. This ravine is not the best place to test a newly purchased pair of shoes. Any abrasion or inconvenience associated with wearing uncomfortable shoes may expose you to unnecessary painful complications and will certainly spoil your trip to the ravine. If you go to Samaria in covered shoes, you should also consider buying the right socks. In the hot climate of Crete, those with an admixture of bamboo fibers or those made of a special material enriched with the coolmax technology are perfect. Due to the appropriate properties, this type of underwear has much better water vapor transmission properties and the surface of the material stays dry longer. This increases walking comfort and reduces the likelihood of unpleasant injuries. We also recommend taking an extra pair of clean, dry socks that you can use to change into Agia Roumeli. This will not significantly increase the weight of your luggage or take too much space and we assure you that your feet will certainly appreciate the comfort that you provide them on the way back. Polecam, naprawdę warto!!! Przepiękne widoki!!! Ponieważ Samaria co roku schodzą spore ilości wody z roztopów, trasa wygląda zawsze trochę inaczej. Np w tym roku w Żelaznych Wrotach nie ma drewnianego pomostu a kamienie ułożone wzdłuż ścian. I po raz kolejny polecam Samarię od dołu - szczególnie że jak wyruszysz tylko jak otworzą bramkę przynajmniej do Samarii będziesz szedł sam. No i oczywiście idąc pod górę widzisz 2 - 3 razy więcej niż idąc w dół. dobry artykuł a chciałabym zapytać czy są jakieś wieczorne połączenia pomiędzy Paleochora a Omalos lub gdzie takiej informacji szukać? Niestety nasz opis będzie poręczny jedynie dla osób, które chcę zrealizować wycieczkę z miejscowości Sougia lub Paleochora. To miejscowości znajdujące się na zachód od wylotu wąwozu Samaria i Agia Roumeli. Wejście do wąwozu Samaria, zwane przez Greków Xyloskalo, zlokalizowane jest na płaskowyżu Omalos. Dostanie się tam rano z Chora Sfakion za pośrednictwem autobusu nie będzie możliwe. Zresztą nawet gdyby takie połączenie było realizowane, to przejazd zajmowałby strasznie dużo czasu. Zakładając, że tego samego dnia chcesz wrócić do Chora Sfakion, jedyną możliwością zrealizowania wycieczki do wąwozu Samaria jest częściowe przejście idąc od strony Agia Roumeli. Będziesz musiała skorzystać z promu płynącego do Agia Roumeli. Ze Sfaki wypływa on o godzinie 10.30. Po około godzinie będzie na miejscu w Agia Roumeli, skąd będziesz mogła wyruszyć do wąwozu. Na spacer po Samarii będziesz mieć około 6 godzin po których musisz być obowiązkowo w Agia Roumeli. O 17.30 masz powrotny prom do Chora Sfakion. To taka wycieczka moim zdaniem dosyć kosztowna i po drugie pozostawiająca wielki niedosyt. Chora Sfakion nie jest dobrą bazą do wycieczki do wąwozu Samaria. Proponuję odłożyć Samarię na następny pobyt, a z Chora Sfakion wybrać się do któregoś ( lub wszystkich) z wąwozów dobrze skomunikowanych z tą miejscowością - Aradena, Imbros, Asfendou czy Kallikratis. Odradzam wąwóz Sfakiano - po pierwsze jest ogólnie trudny, po drugie pod koniec maja był całkowicie zablokowany pniami naniesionymi zimą w najwęższym odcinku - my musieliśmy się cofnąć. Wycieczki dobrze skomunikowane z Chora Sfakion opisałem w komentarzu pod opisem tej miejscowości - poszukaj. Wąwozy Imbros, asfendou i Kallikratis są na mapie "Fragokastello - Plakias" , Aradena - na mapie "Sfakia-Pachnes", obie wydawnictwa Anavasi - dostępne w sklepie obok portu w Chora Sfakion. Jeśli jednak musi to być Samaria to jak pisał powyżej Piotr masz kilka możliwości - można wypłynąć promem o 13:00 do Aghia Roumali, tam przesiąść się na prom do Paleochory o 17:30, przenocować i rano jechać jak opisał Piotr w artykule, tyle że na końcu wsiąść w prom do Chora Sfakion. Można pojechać autobusem o 18:30 do Chanii, tam przenocować i rano 7:45 lub 8;45 pojechać na Omalos i zejść wąwozem. Można też popłynąć promem o 18:30 do Aghia Roumeli, tam przenocować i rano wejść od dołu do wąwozu, dojść na Omalos, tam przenocować i rano wrócić autobusem z przesiadką w Chanii bądź wieczorem pojechać do Chanii, przenocować i rano pojechać dalej autobusem. Czyli jak widzisz nie ma wygodnej metody przejścia Samarii gdy się mieszka w Chora Sfakion - za to jest wiele innych ciekawych wycieczek. Spotkałem się z wycieczkami "od dołu" ale na określony czas - w zależności od sił uczestników. Oczywiście nie przechodzą oni całego wąwozu tylko w chodzą do niego na tyle żeby zdążyć wrócić też promem. Przechodzą tą samą trasę dwa razy ale faktycznie oglądają ją inaczej. Dla niektórych do zaproponowania, którzy nie czują się na siłach na "całość". Pozdrawiam. W tym roku nie byłem w Samarii. Całość Samarii od dołu przechodzą ci, którzy idąc nadmorską wersja E4 nie decydują się na przejście odcinka Aghia Roumeli - Soughia, uważanego za jeden z najtrudniejszych znakowanych szlaków w Górach Białych - np w 2013 szlismy równolegle z grupka Francuzów od Chora Sfakion, w Aghia Roumeli oni poszli Samaria do góry, przenocowali na Omalosie i zeszli wąwozem Aghia Irini do Soughii, gdzie znów się spotkaliśmy. podczas pierwszej wizyty na Krecie "odpuściliśmy" sobie Samarię i uroki zachodniej części Krety. Wówczas polecono nam Samarię we wrześniu /mniejsza liczba turystów :) / W tym roku przymierzamy się do wyjazdu w drugiej części września, ale zaczynam mieć wątpliwości. Planujemy nocleg w okolicach Chani, i zwiedzanie wszystkich zakamarków z wykorzystaniem lokalnych linii autobusowych KTEL. Lubimy zaczynać podróż w punkcie A a kończyć ją w punkcie B, więc wypożyczenie samochodu odpada. Gdzieś ostatnio wyczytałam, że autobusy kursują tylko w sezonie tj do 5 września. Przeglądałam rozkłady jazdy na stronie KTEL, ale nie mogę doczytać czy tak rzeczywiście jest. Czy podróżowanie liniami KTEL staje się nie możliwe lub bardzo ograniczone w drugiej połowie września? KTEL jeździ oczywiście cały rok, po 5 września moze być minimalnie zmniejszona ilość kursów, ale na pewno nie będzie to dotyczyło trasy Chania - Omalos czy Chora Sfakion - Chania, potrzebnych do przejścia Samarii. Wyraźne ograniczenie ilości kursów jest dopiero w sezonie zimowym - gdzieś tak pod koniec października - początek listopada. W drugiej połowie września raczej wszystkie linie będą jeździć, być może niewielkie zmniejszenie częstotliwości. Jeśli będziecie chcieli wybrać się w mniej uczęszczane trasy czasami warto skorzystać z dojazdu na końcowym odcinku taksówką - my w tym roku za odcinki ok 10 km płaciliśmy 12 - 15 euro. Jak będziecie korzystać z taksówek improwizowanych ( raz wiozła nas prowadząca tawernę po pozostawieniu lokalu pod opieką klientów) próbujcie się targować - na początku podaja ceny znacznie przewyższające koszt regularnych taksówek. Bardzo cieszymy się, że zachęciliśmy Cię do przejścia całego szlaku prowadzącego przez wąwóz Samaria. Skrócona wersja naszym zdaniem zupełnie nie jest warta zachodu. Jeśli chodzi o rozkład autobusów na trasach na Omalos oraz z Chora Sfakion, Sougi i Paleochory myślę że może to być również uzależnione od tego czy wąwóz Samaria wciąż jest otwarty. Jednak zazwyczaj termin zamknięcia jest zdecydowanie późniejszy niż 5 września. Nie sądzę aby w tym terminie były już cięte autobusy na trasach obsługujących ruch turystyczny przez ten wąwóz. Zresztą nawet same połączenia promowe są ograniczane dopiero pod koniec października. Tym jednak co powinno Ciebie interesować w drugiej połowie września to aktualne prognozy pogody. W tym okresie mogą się na Krecie zdarzać dni z dosyć obfitymi opadami, które mogą być na tyle silne, że szlak jest zamykany. Zawsze staramy się wrzucać na stronę odpowiednie informacje o tym że taka sytuacja zaistnieje (oczywiście robimy to w miarę możliwości oraz dostępności takich informacji). Z tego względu jeśli zdecydujesz się wycieczką to tak jak pisałem wcześniej zachęcam Cię do śledzenia prognoz ora obserwowania pogody. A jakie polecilibyście Państwo rozwiązanie (dotyczące dojazdu i organizacji) w przypadku chęci przejścia przez wąwóz Samaria w przypadku pobytu w hotelu oddalonym ok. 270 km (w wiosce Koutsounari)? rozwiązania są dwa. Albo z opcją noclegu albo odłożyć na następny raz kiedy hotel będziecie mieć Państwo w zachodniej części Krety. Koutsounari jest naszym zdaniem zdecydowanie za daleko Samarii. Całego nie przejdę - czy warto w ogóle przejśc kawałek? Jesli tak - czy lepiej od dołu do Wrót, czy od góry ze 2-3 km ze względu na malowniczośc? Czy powrót wtedy będzie ostro pod górę? Czy będzie jak wrócić do Paleochory? Proszę odp. na maila - jutro lecimy! Piotr ciężko odpowiedzieć jednoznacznie na Twoje pytanie. Obie części wąwozu różnią się dosyć znacznie swoim charakterem oraz wyglądem. Naszym zdaniem górna część to najbardziej malowniczy kawałek Samarii. Jednocześnie właśnie te 2-3 kilometry na początku szlaku to najbardziej stroma część, którą w tym przypadku będziesz musiał pokonać najpierw w dół a potem w górę. I raczej na pewno będziesz musiał tu przyjechać wypożyczonym samochodem. Wdaje mi się, że w tej chwili nie możesz liczyć na wieczorne połączenie autobusowe do Paleochory (linia ta jest uruchamiana raczej w ścisłym sezonie turystycznym). Z drugiej strony wejście od Agia Roumeli jest mało spektakularne. Początek szlaku to betonowa droga łącząca tę miejscowość ze starą częścią wioski. I dopiero za tym punktem jest właściwie wejście na teren parku. Na plus warto zaliczyć to, że na pewno będziesz mógł zobaczyć żelazne wrota. Ta część wąwozu położona jest stosunkowo blisko od wejścia a droga prowadząca tam jest dosyć płaska. Możesz się pokusić o dalsze przejście wąwozu aż do opuszczonej wioski Samaria. Musisz jednak trzymać pod kontrolą reżim czasowy tak aby zdążyć wrócić do portu na powrotny prom z Agia Roumeli do Paleochory. Wydaje nam się, że obecnie taka wycieczka będzie sporo łatwiejsza do zorganizowania. Jeśli koniecznie musi być Samaria to jedyna możliwość pojechać rano do Chanii, zostawić tam samochód, pojechać autobusem na Omalos ( ostatni z Chanii - 8:45), przejść Samarię i dalej promem do Chora Sfakion skąd autobusem do Chanii. Jednak często lokalne biura podróży oferują wycieczki do Samarii - wtedy zabiorą autobusem z tej miejscowości i tam odwiozą - znacznie wygodniejsze. Ewentualnie zostawić sobie Samarię na kolejny wyjazd a teraz wybrać któryś z krótszych wąwozów - takich które przechodzi się w obie strony - w okolicy Heraklionu polecam wąwóz Rouvas koło Zaros ew Krisa obok miejscowości o tej samej nazwie. Koniecznie obuwie sprawdzone, z twardą, nie śliską podeszwą. Nie idź jeśli jesteś osobą która w ostatnim czasie nie zrobiła przynajmniej 15 km pieszo w pół dnia (po dowolnym terenie). Inaczej bądź pewien zakwasów przez kilka dni które mogą Ci zepsuć wakacje. Cześć Grzegorz. Można jeszcze popłynąć promem z AR w kierunku Paleochory i wysiąść w porcie Sougia. Stąd też jeździ KTEL do Chanii. Czas przejazdu jest podobny. Jednak naszym zdaniem jeśli można wybierać to lepiej jest wybrać kierunek do Chora Sfakion bo jest ciekawsza trasa. Prom po drodze zawija do Loutro, więc jest okazja aby rzucić na nie okiem. Później autokar jedzie serpentynami przy wąwozie Imbros, to też ciekawie wygląda. Natomiast trasa między Paleochorą a Chanią jest dość nudna. Mam pytanie - gdzie kupię bilety na prom w Agia Roumeli do Suogia. Chcę pojechac autem do Omalos, przejść wąwóz, popłunąc do Sougia i stamtąd dojechać autobusem do Omalos . Czy autobus przejeżdza blisko parkingu przy wejściu do wąwozu? Wiem że prom do Sougia odpływa o 17:30 a autobus KTEL o 18:15. Bilety kupisz w Agia Roumeli, w jednym z budynków, raczej nieco w głębi. Autobus podjeżdża na parking. W razie opóźnienia promu kierowca autokaru czeka na prom. czy ten budynek jest jakoś oznaczony? i czy bilet na autobus u kierowcy czy gdzies w kiosku kupię? Ten budynek będzie wyglądać tak jak na zdjęciu. Bilety na autobus - chyba u kierowcy. Co prawda jest kasa biletowa przy nabrzeżu ale tam raczej sprzedają tylko bilety na statek. Najlepiej pytaj na miejscu. Czy ktoś się orientuje do kiedy otwarty jest wąwóz Samaria? czy wchodząc do Parku narodowego od strony Agia Roumeli , czyli od dołu, musze zapłacić za bilet wstępu ? słyszałem, że nie - chociaż chcę iść tylko do żelaznych wrot i powrócic do wioski ? jaki ewentualny koszt dzieci, dorośli ? oraz pytanie jak dojadę autem do Chora Sfakion tam zostawie samochód, kupuję bilet na prom do Agia R. ( podacie koszt dorosłego, dzieci ? ) -to mam od razu kupić bilet powrotny -promem do Chora Sfakion ? nadmieniam, iż nie chodziliśmy w takie długie wyprawy nigdy, dlatego nie chcę, żeby po wycieczce były skwaszone miny ze zmęczenia :) i braku doświadczenia. Nie wiem skąd masz takie wiadomości, że wchodząc od dołu nie będziesz płacić za wstęp do wąwozu. My tylko raz wchodziliśmy od strony Agia Roumeli i uiszczaliśmy opłatę za bilet. Koszt wejścia do wąwozu to o ile mnie pamięć nie myli to 5 €, nie wiem czy są bilety ulgowe, bo w naszym przypadku nie była to istotna informacja. Biletu powrotnego na prom nie musisz kupować od razu. Spokojnie możesz go kupić po powrocie do Agia Roumeli z wąwozu Samaria. Szczegółowe ustalanie cen i godzin w tej chwili nie ma sensu. Godziny kursów połączeń promowych mogą się zmienić podobnie zresztą jak i koszty. Informacje te sprawdź na stronie http://www.anendyk.gr/pages/en/company.php?lang=EN jak już będzie sezon 2018 i wszystko będzie już ustalone. Jeśli chodzi o czytanie tabel kursowania http://www.anendyk.gr/pages/en/timetable.php to w pierwszej kolejności szukasz połączenia które Ciebie interesuje, czyli w twoim przypadku opisane HORA SFAKION – LOUTRO – AGIA ROUMELI. Potem szukasz zakresu dat w których będzie płynąć i w tym wypadku nie ma jeszcze interesującego Ciebie okresu sierpnia. I w zasadzie to chyba tyle, jak już będzie dostępny rozkład na sezon 2018 po prostu odczytujesz w jakich godzinach będą połączenia. Można domyślać się, że godziny będą podobne z ewentualnymi korektami. Wiesz to czy zdążysz na prom o godzinie 13 to już tylko zależy od Ciebie. Pamiętaj tylko, że sam prom między Chora Sfakion a Agia Roumeli płynie godzinę, czyli będziesz tam na godzinę 11.30. Moim zdaniem 1,5 godzin na dojście do najwęższej części wąwozu i z powrotem do Agia Roumeli to bardzo mało czasu. Kolejna sprawa to osobiście nie pamiętam aby o godzinie 13 był prom powrotny z Agia Roumeli do Chora Sfakion. Tak jak pisałem wcześniej – planowanie najlepiej rozpocznij jak już będą rozkłady na sezon 2018.
w przewodniku Lonley Planet wydanym przez Pascala znalazłem informację że 1 maja jest panigyri ( dzień święty ) św Marii Egipskiej, której kaplica jest w byłej wiosce Samaria i jest to jedyny dzień w roku, kiedy każdy może przenocować w wiosce - przygotowuje się kilka starych domów, wolno też rozbić namiot. Czy spotkaliście się gdzieś z tą informacją, a jeśli nie to może spróbujcie podrążyć temat - byłoby ciekawie przenocować w Samarii, poza tym byłby to sposób na spokojne podejście Samarią - bo za jednym razem sie da, ale jest to i męczące i trzeba się spieszyć - nie ma czasu spokojnie pokontemplować wąwozu. My w 2012 wchodząc do dołu napotkaliśmy sporą ilość ludzi z dużymi plecakami, mieli podpięte śpiwory - było to 1 maja więc może ten nocleg to z 30 kwietnia na 1-go maja? Piotr - coś w tym jest ale nie do końca tak jak napisali w przewodniku. Zacytowałem Lonley Planet i napisałem do osób zajmującą się stroną FB parku Samaria. Odpisali mi, że owszem dzień w którym obchodzone jest święto Marii Egipskiej to jedyny taki dzień w którym można nocować na terenie parku. Miejscowi udają się tam aby nocować a następnie obchodzą święto patronki. Przewodnik jednak myli się co do daty tego święta. Jego data jest uzależniona od daty świąt Wielkanocnych. Dzień Marii Egipcjanki przypada na 5 niedzielę po Wielkim Poście (licząc jako pierwszą - Niedzielę Palmową). W tym roku więc data ta przypada na 22 kwietnia. Ewentualnie gdybyś w przyszłości chciał skorzystać z tej okazji to potwierdź datę przez kontakt na ich stronie: http://www.samaria.gr/en/home-2/ odpowiadają dosyć sprawnie. Czyli łatwiej licząc - dwie niedziele po Wielkanocy - bo w tym roku była 8 kwietnia. Trzeba poczekać na taki rok jak będzie to juz po otwarciu wąwozu i wtedy w pierwszym dniu podejść spokojnie do Samarii i na drugi dzień powoli na Omalos. Ja obrałem jeszcze inną opcję zwiedzenia wąwozu. O 5tej wyjazd z hotelu w Platanias samochodem do Omalos. Jest wyremontowana szeroka droga więc dobrze się jedzie. Wąwóz otwierają o 7mej ale udało się uprościć strażnika i mogłem wejść o 6tej. Zaznaczyłem tylko panu że będę wracał ... dzisiaj spowrotem. Popatrzył tylko na mnie i się uśmiechnął . Odnotował tą anomalie by ilość turystów się zgadzała i mogłem ruszyć na szlak. Dodam tylko że to moja druga przygoda z Samarią , tylko wtedy była to wersja z promem. Tak więc wąwóz już znałem ale teraz prezentował się 100 razy lepiej. Miałem bo tylko dla siebie. Przez 14 km żadnego turysty. Można było ochłonąć wszystkie odgłosy przyrody: szum wiatru, potoku , odgłosy ptaków i bliskie spotkania z dzikimi kozami. Duża ilość cienia i miejsc gdzie można się ochłodzić wodą powodowało że szło się bardzo przyjemnie. Piękne formacje skalne, pionowe ściany robiły wrażenie. Po dotarciu do wyjścia z wąwozu znów deklaracja, że będę wracał i można było udać się w ostatni odcinek do portu. Tam szybka regeneracja . Posiłek w tawernie, uzupełnienie zimnych płynów i w drogę powrotną . Ale jeszcze krótka kąpiel by się schłodzić przed trudniejszym etapem. Postanowiłem trochę zmienić trasę powrotu i jeszcze zaznaczyć o ruiny twierdzy na skałach nad portem. Mozolnie wspinanie po kręte ścieżce w pełnym słońcu rekompensowały widoki z twierdzy. Od ruin prowadzi wydeptana ścieżka przez las prawie pod samo wejście do wąwozu. Znów odnotowano że to ja i bez dodatkowego płacenia mogłem wracać na Omalos. Teraz wąwóz wyglądał trochę inaczej. Pełno ludzi wschodzących, gwarno , ciasno i duuużo cieplej. Gdyby nie punkty z wodą było by ciężko wspinać się do wejścia. Ale im bliżej Omalos tym bardziej znów byłem sam na szlaku. I było spokojniej i ciszej. W końcu o 18tej zameldowałem się przy kasie i z radością oznajmiłem swój powrót. A strażnik zamknął za mną bramę. I tak zaliczyłem otwarcie i zamknięcie wąwozu Samaria.Było ciężko ale wrażenia bezcenne. Dokonałem 40 km w 12godz.Dobre trekkingowe buty za kostkę właściwy strój ,zapas wody i prowiant i można tego dokonać. Pozostał tylko powrót na kolację do hotelu i przygotowanie na powrót na Omalos i wejście na Gingilos 2080m wys. nad wąwozem Samaria. Moje gratulacje - jest to duże przejście. Gigilos z Omalosa przy tym to "pikuś" - no chyba żebyś zszedł na Sedonię - to juz jest konkretne przejście. Polecam na przyszłość góry - są puste, piękne i wymagające - ale jak przeszedłeś 2x Samarię w jeden dzień to nie ma problemu. Na zachód od Samarii sa dwa wąwozy - pierwszy skrajnie trudny, wymagający technik alpinistycznych Kladou i następny - Tripiti - wąwóz długości Samarii ale pusty. Warto się zainteresować. A konkretnie skąd - bo na Krecie 200 km to może być 3,5 godziny a może być i 5. Jeśli wyobrażasz sobie Nową Drogę Narodową jako autostradę lub drogę szybkiego ruchu to niestety jesteś w dużym błędzie. W takiej sytuacji najlepiej wykupić wycieczkę w tamtejszym biurze podróży - oczywiście jak potrafisz spać w autobusie - lub pojechać dzień wcześniej na Omalos, tam przenocować i rano iść do wąwozu. A poza tym na Krecie w każdej wsi jest wąwóz i może lepiej poszukać czegoś bliżej, a Samarię zostawić na kolejny wyjazd - w rejon zachodniej Krety. Going deep into the Richtis Gorge near Exo Mouliana, it's hard not to resist the impression that you enter a land completely different from the rest of Crete. The abundance of water and shade mean that even at the peak of the tourist season, this place is full of lush vegetation. So obvious rust colors dominate in other places of Crete, here they are completely absent, because their place replaces juicy greenery.